Benjamin Frank was a distant relative of the butcher next to his greengrocer’s shop on the Hoofdstraat (number 50), where he sold fruit, fish, etc. Benjamin was one of the sons of Samson Frank (1850-1932) and Rebekka Stern (1845-1936), both from Meppel. They had four children: Benjamin, Jacob, Juda and Mozes Samson. Benjamin was born in Meppel on the 6th of April 1883 and married in 1911 to the Amsterdam born, Rachel Frank. Rachel was one of four children (Esther, David and Leentje were the other three) of Meijer Frank (1853-1936) and Maria Kan (1856-1928). Meijer as well as Maria were both from Meppel. They lived for some time in Amsterdam, but later returned to Meppel, and came to live at Grote Oeverstraat (number 64). Benjamin and Rachel had four sons: on the 18th of February 1912 Samson was born, on the 1st of January 1915 Meijer (he died 18 days later), on the 25th of July 1916 Meijer and then on the 26th of October 1921 Bernard was born. 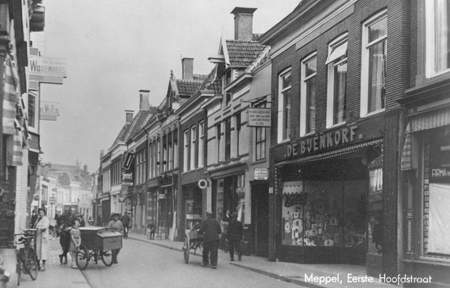 Meijer and Bernard photographed in 1942.
walking in the Hoofdstraat. (Behind) Eli van Gelder. For some time Benjamin Frank was the undertaker’s man for the Jewish community and one of his obligations was to walk in front of the funeral procession to the cemetery. He got so used to walking so slowly, that he became accustomed to it. That is how he got the nickname ‘de slakke’ (the snail).His son Meijer Frank did not walk very fast either so it seems. When Frank sr. was walking on ‘de Bult’, a couple of fisherman called him and said ‘Frank, daor komt oen zeune ook an’ (‘Frank, your son is coming’). Franks reaction was: ‘Lop eij zacht, nog zachter als ik?’ (Frank’s reaction was: ‘does he walk slowly, more slowly than me?’) After receiving a confirmation he answered: ‘Nou, dan is ie het vaste’ (‘Now, then it’s him for sure’). There were also rumours that Meijer was rather lazy; customers who came into Frank’s shop would always find him lying in the small ‘upper room’, with his head nearly in the shop. Like many Jewish shopkeepers, Benjamin also had his shop open on Sundays; for many people a godsend, because if they had forgotten to buy something, they could go to Frank’s shop on Sundays. 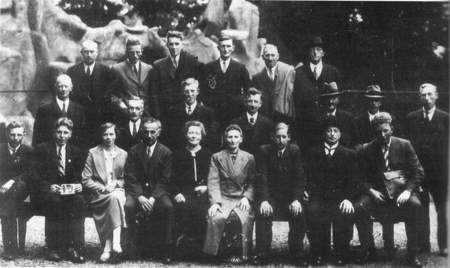 The greengrocers of Meppel, on a trip to the zoo in Emmen; (sitting 2nd on the right) Benjamin Frank. If we had forgotten to buy something, which would happen fairly often, I was sent with a little change to do the shopping at the Frank family on the Hoofdstraat on Sundays. ‘Quite useful’, a shop that was open all week, because also on Saturdays, which was after all their Sunday, the shop was open. After I had bought and paid for what my mother needed, Mr Frank would always say as a goodbye: ‘come during the week as well. Benjamin Frank en Benjamin van Gelder. 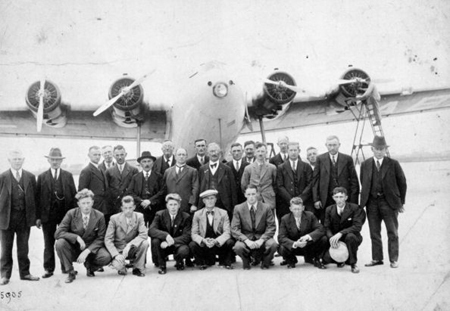 Doing business during the Second World War ended very soon for the Frank family. 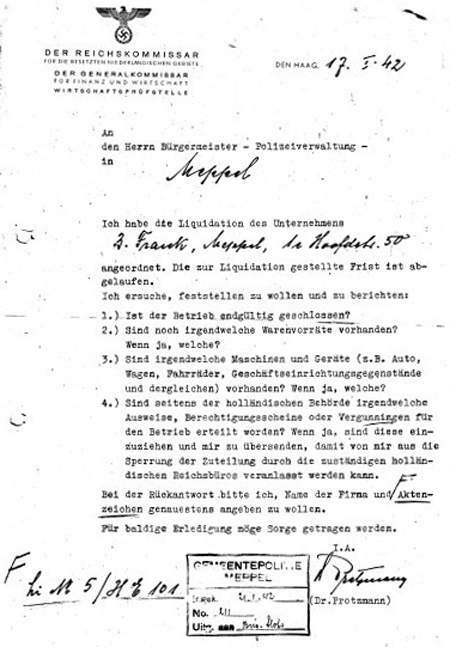 Already on the 31st of October 1941, Mayor Wisman sent a letter to Generalkommisar fűr Finanz und Wirtschaft (the General commissioner for Finance and Economy) that Benjamin’s shop had been closed down and that everything had been taken from the shop. Frank’s greengrocer’s shop was one of the first Jewish businesses in Meppel to close their doors. Information form regarding the liquidation of Benjamin Frank’s greengrocer’s. A short time later, it was the family’s turn; the first one to leave the house was father Benjamin. This almost sixty-year- old man was transported on the 20th of July 1942 to work at the labour camp in Orvelte. Almost a month later the three sons followed: on the 17th of August 1942 all three went via labour camp Linde to Westerbork. They would never see their parents again, because on the 24th of August 1942 all three went ‘voluntarily’ with the train to Auschwitz. Probably, the Germans had given them false hope, because all three were killed on the 30th of September 1942. Sara Heny, the wife of Samson, left, after her husband had disappeared, for Den Haag (The Hague), where she was taken from her house; she was also killed in Auschwitz on the 30th of September 1942. Benjamin (who was at home on leave from the labour camp) and his wife were taken from their home in the middle of the night on the 3rd of October. None of the neighbours ever saw them again. In the morning they saw that the greengrocer’s shop of Frank was sealed. However, father and mother Frank had a chance to escape. Father and Mother Frank had forgotten something when they arrived at the station, so they asked policeman Bralten: ‘Can we go and pick up some of our things? ’He did not have a problem with that and he probably thought: ‘They at least can escape.’ Out of the question, twenty minutes later Mr and Mrs Frank, huffing and puffing returned … just in time to catch the train! Bralten and his colleague could only shake their heads. Benjamin and Rachel only stayed two days in camp Westerbork. On the 5th of October 1942 they were transported from Westerbork to Auschwitz and on the 8th of October 1942 they were killed. Their last thoughts must have been with their children: How were they?